I knew all week that I had Kaylee booked in this morning for 'Minnie Mouse nails.' 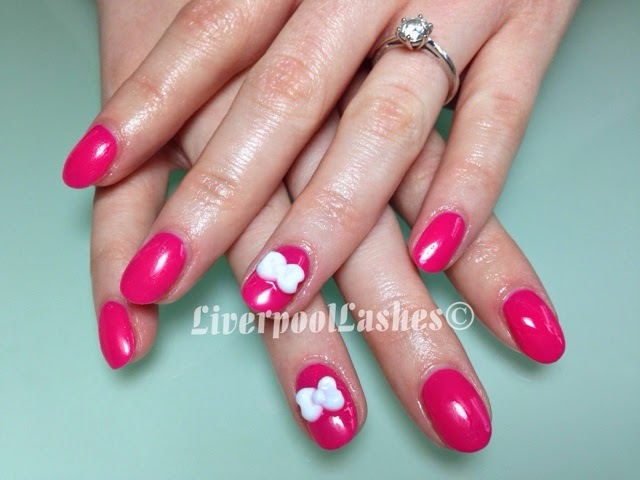 She had noticed a colour pop that I did with pink and white polka dots and a handmade acrylic bow. This is actually the colour pop that I did in the tutorial which shall be at the end of this post. Kaylee decided when I applied Shellac Pink Bikini that she didn't want the polka dots as she loved the effect as it was but definitely wanted the bows. I enjoy creating these bows as they completely fit the shape of the nail so nothing get get trapped underneath during the client's day to day life. I would say it definitely requires a little bit of practice but I love the result!